NETWORK UPDATE: SUNDAY NIGHT FOOTBALL adjusted up to 8.7, up 0.7 from last week. In addition, BLOOD & OIL gained 0.1 in final numbers, as did THE SIMPSONS and 60 MINUTES, but MADAM SECRETARY went down the same. CABLE HIGHLIGHTS: On a very busy night, AMC’s FEAR THE WALKING DEAD’s season finale easily outran everyone else, even slightly down 0.07 to 3.37. A special TALKING DEAD followed at 1.19. The season finale of FX’s THE STRAIN was steady with last week at 0.54, but that was down a huge 0.43 from last October’s finale. On HBO, THE LEFTOVERS returned at 0.33, very far from its 0.8 debut and its 0.73 finale last year (and because that finale aired on Labor Day weekend, even worse compared to the 0.94 it had scored the week before that). It was followed by PROJECT GREENLIGHT (up 0.06 to 0.15), DOLL & EM (down 0.03 to a dreadful 0.03, with 147K total viewers) and LAST WEEK TONIGHT (up a tick to 0.28). On Showtime, HOMELAND returned at 0.56, which was steady with its October 2014 premiere (0.06 below the season finale), and THE AFFAIR was at 0.18, above its 0.14 series premiere, but below its 0.25 season finale. 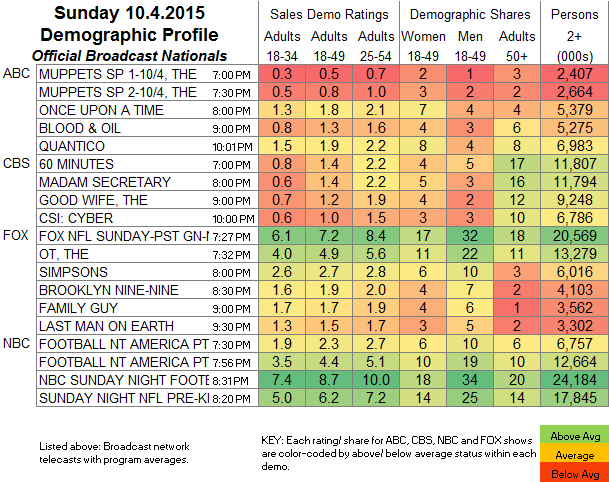 Elsewhere, Adult Swim’s RICK & MORTY was up 0.04 to 0.97, and YOUR PRETTY FACE was down 0.04 to 0.48. VH1’s BASKETBALL WIVES gained 0.05 to 0.78. On E!, KEEPING UP WITH THE KARDASHIANS was up a tick to 0.77, DASH DOLLS lost 0.04 to 0.23, and HOUSE OF DVF dropped 0.07 to 0.12. On Discovery, ALASKA: THE LAST FRONTIER was at 0.74, and lead-out NAKED AND AFRAID was at 0.57. HALLOWEEN WARS gave Food Network 0.65, and with that lead-in, CUTTHROAT KITCHEN rose two-tenths to 0.57, and GUY’S GROCERY GAMES gained 0.07 to 0.46. On Bravo, MARRIED TO MEDICINE was up 0.05 to 0.52, while DON’T BE TARDY lost 0.02 to 0.43 and MANZOD WITH CHILDREN was up a tick to 0.28. 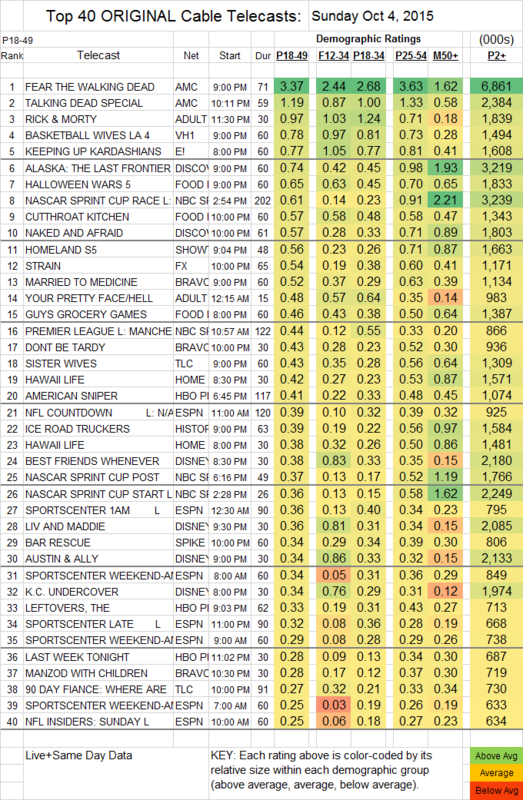 On NBC Sports Net, a NASCAR RACE scored 0.61 in the afternoon, and PREMIER LEAGUE SOCCER was at 0.44 in the morning. ICE ROAD TRUCKERS (History) was at 0.39. Sunday preliminary broadcast ratings: 60 Minutes and the CBS 7:00-7:30 half hour specifically inflated by 10 minutes of the end of Masters coverage from 7:00-7:10 pm (mostly the monumentally awkward and amazingly tense ceremony in “Butler Cabin,” where the Green Jacket is awarded).